Minor edge wear, corner wear, and creasing. Showing Boalt Hall of Law. 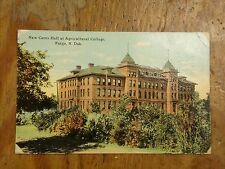 Vintage Postcard New Ceres Hall At Agricultural College, Fargo, N. Dak. All in excellent, unused condition. The origin of Albion College lies not in the city of Albion, but about 10 miles (16 km) southeast of the present location of the college. No classes were ever held at the Spring Arbor location. The trustees applied to move the seminary to Albion in 1838, and the legislature approved the move in 1839. All have been removed from the scrap book of my ancestor leaving paper residue, most not visible on front. Worcester College Gardens, Oxford. RPPC Proofs Philippines Provincial Laguna & Rizal Hinulugang Taktak 1900s RARE!! RPPC Proofs of Philippines Provincial Views. from 1900s and VERY RARE set of 12 PROOFS! Condition is Good to Very Good. I try to make sure all cards are at least in a collectible grade. All are divided backs Three are from the Mirror series Hold the mirror up to Nature. New College fromo the Gardens, Oxford. Queens College Chapel and Quad, Oxford. ATLANTA GA. MOREHOUSE COLLEGE PAPERWEIGHT HONOR TO DR. ROBERT M. FRANKLIN JR.
ATLANTA MOREHOUSE COLLEGE GLASS PAPERWEIGHT IN HONOR OF PRESIDENTIAL INAUGURATION OF DR. ROBERT M. FRANKLIN JR. FEBRUARY 15, 2008. MEASUREMENTS: W 4 X H 1 3/4 INCHES. Condition is Used, PRE-OWNED. Shipped with USPS First Class Package. ALL SALES ARE FINAL, NO EXCHANGES, NO REFUNDS, NO RETURNS. PLEASE CONTACT SELLER SHOULD YOU HAVE ANY QUESTIONS REGARDING THIS ITEM BEFORE PURCHASING ITEM. I have done my best to picture and describe this item. Picture is of the actual item you will receive. See picture for a depiction of condition. Photography by Margaret J. Rakas. Hower House. The University of Akron. Very Good Condition. 60 Fir Hill. It is pre-owned in pretty good condition. The envelope has a little wear. There may be creases, corner wear, ink on the front/back, flaking or other issues. The photos give examples of the condition. They are about 5.5"X3.5". The cover is loose on the spine area but the binding is still well intact. "Y" pennant, probably for Yale; pennant waved by College Girl. 3 College Girls in antique buggy. Wear Yale blue and white dresses with large hats. Edges/corners have minimal wear/use. May have discoloration due to age/storage. See photos for visual. Vintage Postcard Entrance To Anderson College, Anderson, S.C.
Card is unused and is in very good condition with very slight corner wear. 5-1/2" X 3-1/2". 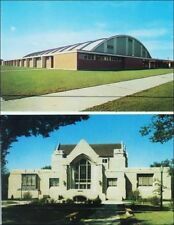 Vintage Postcard Tabor Academy Administration Building Dormitories, Marion Mass. Card is unused and is in very good condition. 5-1/2" X 3-1/2". STANFORD COLLEGE POSTCARD BOOKLET PHOTOGRAPH ALBUM OF VIEWS CALIFORNIA SOUVENIR Nice Booklet of Picture Postcards of the Stanford University Campus. Sepia style Photographs sized at 5 3/8" wide x 3 3/8" tall all Postcards are present. Very good condition considering its age nice clean crisp pages 24 in all. 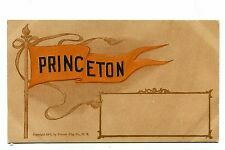 This would make a nice gift for the Stanford fan or Alumni. See all photos to help you judge condition, please make sure if fits your intended wants needs and use. Happy to answer questions and please do so before purchase, Thanks for Buying!. The card shows age wear and discoloration. See Pictures. Trinity is the 2nd oldest college in CT after only Yale University. Card published by E A Sherman, Hartford CT.